One of our most important roles as review managers is to make sure our clients comply with the law as it relates to reviews - in letter and in spirit. 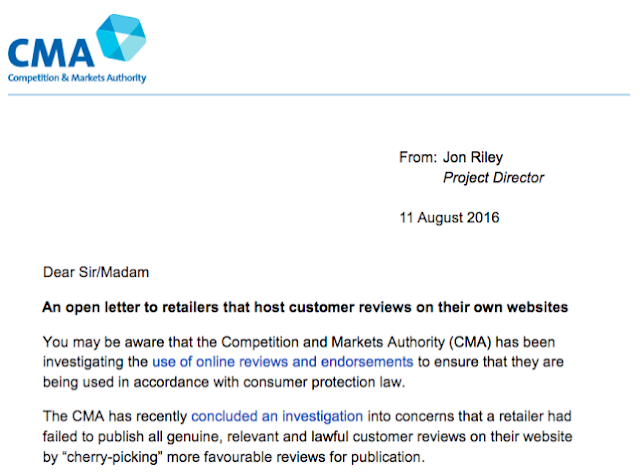 Most businesses, when we first meet them, are unaware that reviews are governed by legislation. But, just as with almost every aspect of business life these days, they are. On 1 April 2014 the Competition and Markets Authority (CMA) took over many of the functions of the Competition Commission and the Office of Fair Trading. We see examples like the ones below nearly every day. They are mostly innocent, resulting from ignorance of the rules. Just as important, they do the business no favours in the eyes of the sophisticated consumer (or competitor). Our systems are expressly designed to comply with the CMA rules, in word and spirit. This is why Resolution incorporates the 'promise to publish' and why our clients incorporate a 'Write a Review' button into their websites, offering anyone the opportunity to write a review, whenever they choose to do so (and as often as they wish). It is also why the invitation to copy the review to Google (or the nominated external site) is automatic - not at HelpHound's or our client business's discretion. Can you expand on HelpHound's 'promise to publish'? Anyone - and we mean absolutely anyone - has the ability to write a review to a HelpHound client's website. They don't have to wait to be invited - and they will always be invited to publish their review. 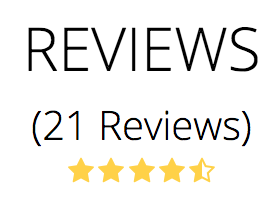 While this may seem a little nerve-wracking for the business - potentially opening it up to unfair criticism (and even 'fake' reviews) please read on - there are very good reasons why our clients have succeeded with reviews. Perhaps most important of all, it means the business does not make the common mistake of inadvertently driving its unhappy customers to write potentially inaccurate or misleading reviews elsewhere - commonly on Google. How does that work in the context of Resolution™? So a customer can write an intentionally misleading review of our business and have that review published? In theory - yes. It's the price paid for complete transparency (and the credibility that flows from that transparency). In practice it very seldom happens - and if it does happen the business always has the right-of-reply. Resolution is designed to minimise the chances of an inaccurate or misleading review being published by allowing the business and the reviewer to engage pre-publication. But the reviewer will always be invited to post their review. In the many years of experience we have of operating Resolution (and the many thousands of reviews that we process on behalf of reviews and our client businesses) we can count the instances of a reviewer persisting in publishing a review containing an error of fact on the fingers of one hand. Inaccurate or misleading reviews benefit no-one - and that's the reason for having Resolution in the first place. Are there any more safeguards? We will do our best to establish that the reviewer has (or has had) a relationship with the business. If we can establish that the reviewer has purely malicious intent we will revert to the reviewer and ask them for more particulars of their relationship with the business. No-one - not HelpHound, nor our clients, nor - most important of all - the consumer benefits from the kind of reviews that have got sites like Yelp a name for publishing false and malicious reviews. ...by doing everything we describe above - in compliance with the regulations. If you follow these simple guidelines you will find that your business is rewarded by those consumers who appreciate openness and honesty. If you have any more questions - about what we do here at HelpHound or what you are currently doing with regard to reviews - please do not hesitate to speak to us.